If you think goalkeepers only save the goals then you might bit surprise that few goalkeepers set goals record. We here provide you the details of the best goal-scoring goalkeepers in the world. The list is lead by the Brazil goalkeeper (Rogério Ceni) who scored more then sixty goals in a career with club Sao Paulo. He made debut in 1990 and retire in 2015 and with mos goals as goalkeeper he made world. Rogério Ceni is one of the best goal keepers in the world. He scored most goals that later become the history in the world. Ceni mostly score goals on free kick. 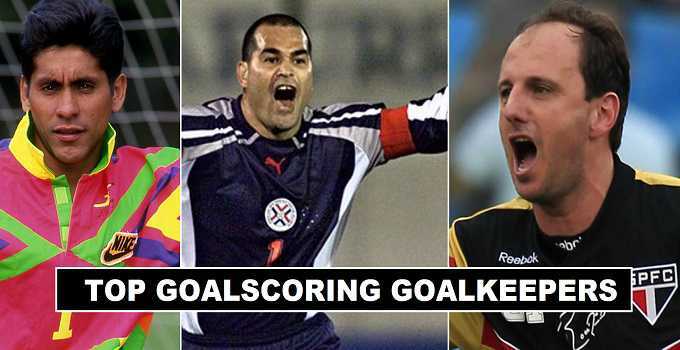 José Luis Chilavert not only good goalkeeper but also a great finisher. He becomes the second most goalscorer goalkeeper in football history. The best thing about his goal keeping career is that he scored 8 goals in International matches. Jorge Campos well known for his goal scoring skills. He scored 46 goals throughout his career with UNAM and Atlante. If we talk about accurate free kick taking goalkeepers (Jorge Campos) is one of them. René Higuita who get famous after saving goal with scorpion kick against England in 1995. Higuita score more then 46 goals in his club career of football. After singing with Independiente Medellín in 1999 for one year deal, till 2000 he made 20 appearances for club and scored 11 goals.